Thank you Lord for helping me to survive this week! I couldn't have done it without you!! It's been a wild and woolly one for sure! And most of it all came down yesterday, I felt like Chicken Little...."the sky is falling! The sky is falling!!" My day yesterday included.. 2.) Bob bought me a new prepaid cell for my birthday......I am not real happy with it OR the provider at the moment because they swapped my phone number so I'd have the same one BUT left my minutes and time I had accumulated off of it....so I spent 45 minutes on HOLD just to talk to some chicky that could barely speak English and for her to Tell me "we need to put codes into the old phone" OK.....you disabled my old phone.....now they think I am trying to cheat them out of 189 minutes....yeah, I have nothing better to do with my time......And why do all of these 800 numbers connect us overseas? Is it too much to ask to speak to someone I can understand????? 3.) My car is about to croak.....we THINK it has a cracked head....EI YI YI!!!! And I have no heat....and it was like 20 degrees yesterday morning. 4.) Jesse Broke Brandon's glasses yesterday because he felt compelled to sit on his head......lol. Brandon turned over to dump him in the floor and his glasses got mangled in the process.....so this weekend it's glasses shopping time....AGAIN! 5) My mother.......really, do I need to elaborate? LOL She is making me crazy!!! Pray for her....seriously. She is in total denial about Brandon not wanting to see her.....he's mad because she threw a fit over him going to a friends house when it was "her" weekend to come visit. Harsh words were said on both sides. He says he never wants to see her or talk to her again and she won't quit calling.....lol. yeah, very childish.......but he is 10 and she is an adult! There comes a time when kids start to grow up and want to be with their friends and she just can't accept that. So now there is this big deal over all of his stuff that's at her house. She has spoiled him rotten and there is an obscene amount of stuff up there. A TV, laptop, electric guitar, ps3, he has a whole other wardrobe up there....she says he can't have none of it now....and that has him even madder......she thinks that by with holding material things she can get him to do what she wants....so far its not working and she can't stand it. Aren't you glad you aren't me??? LOL. I dunno WHY I can't have a cool dysfunctional family rather than an outright insane one......lol. Life's not ALL bad tho!! 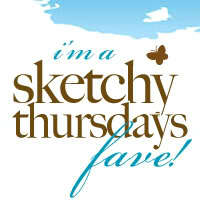 Cuz guess who was picked as a Sketchy Thursday fave yesterday for this layout????? I am super excited to be among the other faves! Seriously.......I looked at them all (and the post is link above so you can go drool over their layouts!!! )﻿ and was just in awe......soooo many awesome LOs .....and then there was mine.....LOL. Dunno how that happened but THANK YOU!!!! They had a huge turnout last week and this week there is another killer sketch to play with......I'm gonna work on mine tonight!!! SO.......did I tell you I am trying to redo my house little by little?? I have the paint all picked out for the "momcave" and for Brandon and Jesse's room. Gotta do LOTS of wall prep in both places first so it will be a while before i can share photos. 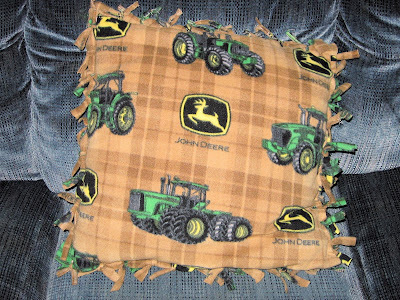 In Brandon and Jesse's room we are goin with a John Deere theme. They want the walls painted John Deere green......and of course Bob won't go for that......LOL. He's not the adventurous sort that I am :) So we settled on a beautiful brown paint.....I can't remember the name of it right now.......but I figured paint the walls a neutral and go crazy with the linens and accessories. More practical that way anyways cuz little boys tend to grow out of fads pretty quickly!! I found this fabric at Hobby Lobby in the remnant bin. Its the first place I go even tho I really don't know how to sew.....lol/ I saw the John Deere fleece and right away thought of Brandon :) We toyed with what to do with it and I saw a no sew pillow somewhere that I had to try....so (or no sew) here it is!! I took the photo in my living room so excuse the crappy lighting. This is actually a really good sized throw pillow. I searched for a pillow form at Hobby Lobby and the4 tiny ones were like $7......I decided to just go with a thrift store throw pillow and do this over it....no one will see it anyway! Then you just cut the fabric in a square that is slightly larger than your pillow........then go around it and cut fringe every couple of inches....make it long enough to double knot all the ay around and PRESTO! A cute CHEAP John Deere accessory!! Fabric was around a buck....a buck fifty at the most. the pillow was 99 cents. I have some fabric left but not a lot.....so I am gonna do another one like this , just smaller. Stay tuned for pix as we progress with my home improvement scheme!! I'm probably gonna link my pillow to a few sites so keep checkin back to see where we wind up :) And hopefully I will gather some more followers....I am at 79 right now!!!!! WOOOO HOOoOO! 79 crazies just like me....whoda thunk it.....LOL. Pillow linked to these FAB parties!!! Go see all of the AWESOME crafty inspriation!!!! Tina, dont take this personally but I think your mom is off of her rocker! she is unnaturally obsessed with Brandon, we have talked about this before, I think he should stay away from her. Ok, on to other things, I am so jealous that you get a momcave! I can hardly wait to see all of the pictures of the newly repainted and decorated rooms. The pillow is adorable! you are So creative!! Our stinking ex's wives think we are so stupid... good grief! Congrats on being selected a fave. I really thought that one was cute, too! Love the pillow! oh no!!! sorry to hear that you're having a bad week. congrats though on the fave/featured layout - - very much deserving!!! congrats on the Sketchy fave! I'm not surprised at all - love that layout! Hope you have a better week ahead!